Certify examined more than 10 million travel receipts and expenses from North America, and found an eight percent increase in market share for Lyft in the second quarter of 2018. Meanwhile, Uber and taxis declined three percent and five percent respectively. Uber still remains king of ride-hailing with nearly three-quarters of the market (74 percent), having a significant lead over Lyft, clocking a mere 19 percent. Cabs trail significantly with their less than double-digit share of 7 percent. Ride-hailing services are on the move, according to Certify. The company, which began tracking the market in 2014, reported that Uber had 26 percent of transportation expenses and taxis dominated with 74 percent. 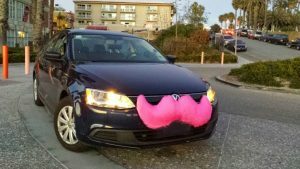 At that time, Lyft had less than one percent of market share. Uber can also claim the title of costliest, as business travelers spent $26 per Uber ride on average and $22.37 for Lyft. At this rate, it’s possible for Lyft to overtake Uber in a dramatic finish, although it might take a few more years. Only time will tell as the race continues for the 2018 ground transportation championship. While not as fast as NASCAR, at least the courses are more than just left turns. Technology also helps those business travelers who drive themselves around and might otherwise spend hours looking for parking. Business travelers are increasingly using apps like SpotHero for the much-coveted parking space, according to USA Today. In fact, the use of SpotHero grew 216 percent from Q2 2017 to Q2 2018. This may be something I have to try when I’m driving around Miami. Business travelers fueled up with driving services too. According to another USA Today article, GrubHub reported 35 percent of all food deliveries last quarter, a 10 percent drop from 2017. Second place went to Uber Eats with an 11 percent increase (25 percent of market share) and DoorDash came in third with 20 percent. Lagging behind with 11 percent was Postmates. DoorDash dominated in the amount spent for food delivery though. On average, a DoorDash customer spent $75.21. Meanwhile Uber Eats customers paid less than half of that with transactions averaging $34.30. Business travelers, do you use ride sharing services like Lyft and Uber? Or do you stick with the tried-and-true taxis and car services? How about your food delivery? Tell us your favorite methods of travel and food delivery on our Facebook page, or on our Twitter stream.